My first visit to this well known attraction near Wilmington, New York in the Adirondacks. With rain threatening, I was lucky to have found a great viewpoint from the rocks downstream from the falls pretty quickly. 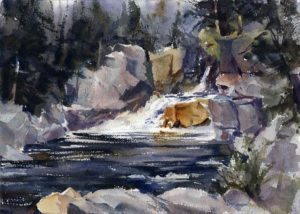 From that vantage point, the interest for the painting was in the energetic progression of the water, down the flume in the distance and powering forward to spill over the foreground rocks. The gorge formed by rocks force the water down a narrow channel, focusing the force on the boulders at the edge of the pool. This painting is done on Arches 140lb Rough watercolor paper. I’ve recently begun working on it. 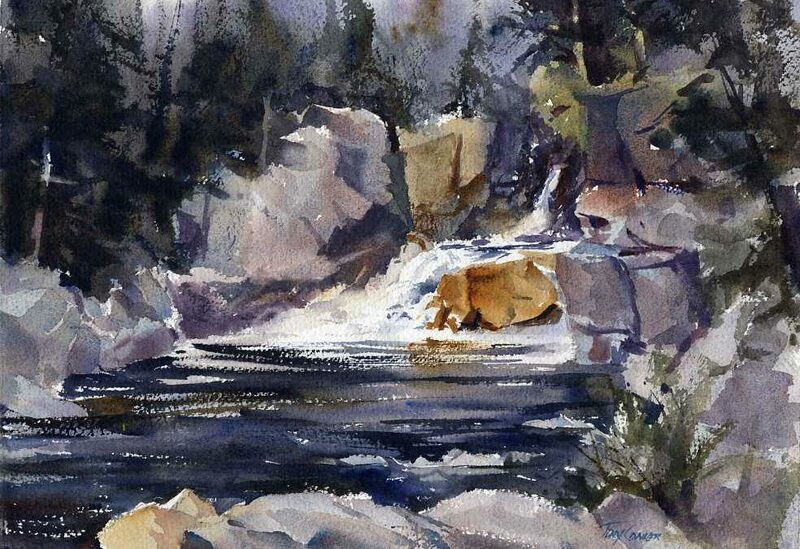 It takes fluid washes as well as cold press but is especially great at taking the direct marks and strokes that I am fond of.